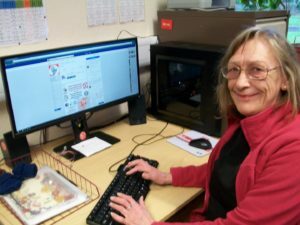 A Messenger volunteer updating Facebook. Photo by Sam Vines-Stancill. The Messenger isn’t just a newspaper, it’s a community of enthusiastic volunteers from all walks of life. Come and join us! The Messenger wouldn’t exist without its volunteers. They are involved in all parts of running a community newspaper. People volunteer for us for all kinds of reasons, from building their confidence and making new friends, to developing new skills and increasing their job prospects. Volunteering is flexible, with opportunities during the day, evening or weekends … you can take on as much as you have time for. We provide one-to-one support and training for volunteers, and can help you along every step of your journey with us. Our volunteers gain skills and valuable experience by being involved, and they make the Messenger a great community newspaper. Abbeyfield Road, Sheffield, S4 7AT. Alternatively you can fill out this form and we will get back to you as soon as we can. I give my consent to be called regarding the roles I would like to volunteer in. Your information is kept safe and will not be used for marketing purposes.